I haven’t tried another detergent, but a similar detergent would probably work. I’ve used whatever ammonia is available, “lemon” or clear. The “lemon” adds a yellow tint to the cleaner. I use canning jars, but have used old pickle jars. To clean your jewelry, depending on what it is, dip for about 10 seconds or leave in for several minutes, remove, gently scrub with an old toothbrush, and rinse off with water. 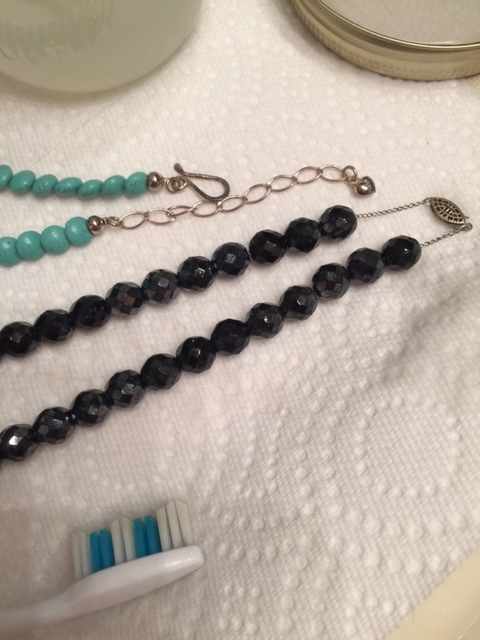 Leave jewelry to dry or dry with paper towel or cloth. 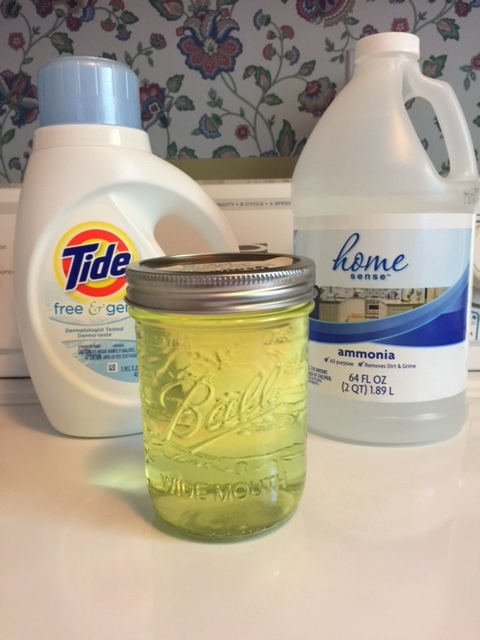 This cleaner works great on vintage glass jewelry. 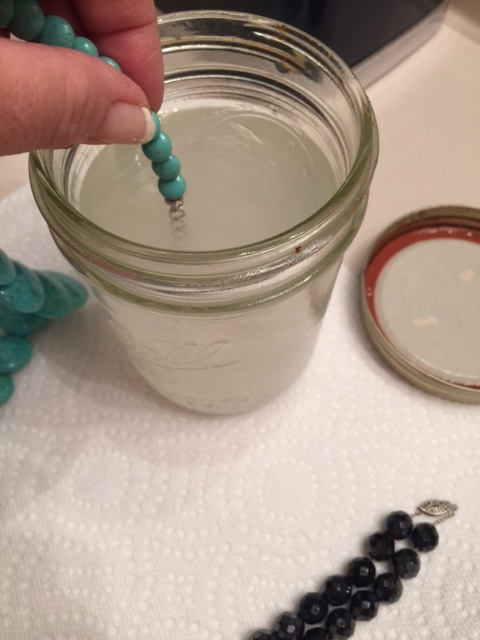 However, do not use this method with foil-backed rhinestones, as submerging the rhinestones in any liquid can discolor them or cause them to become unglued. I gently use a glass wipe on foil-backs. This cleaner also works great on contemporary jewelry – gold, silver, precious and non-precious gemstones. My husband, Jeff, frequently asks me to make a case or two for him to give to his customers at J. Mullins Jewelry & Gifts. Not for use with pearls or porous stones, such as turquoise and opal. A commercial gentle jewelry is recommended for pearls and porous stones. 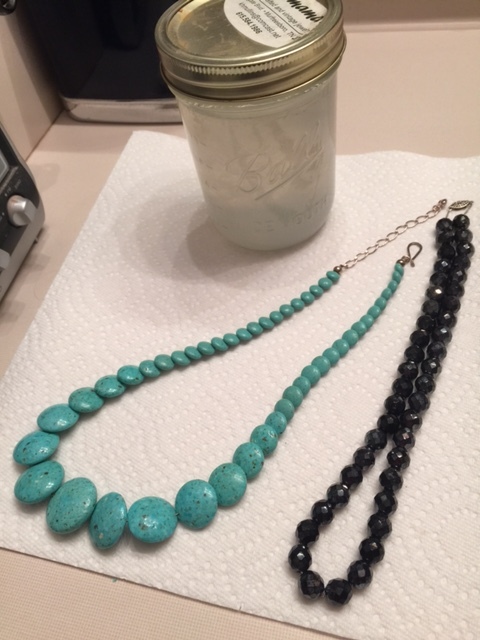 The pictures below feature a turquoise necklace, a vintage black glass with AB coating necklace, and vintage glass and crystal bead earrings. 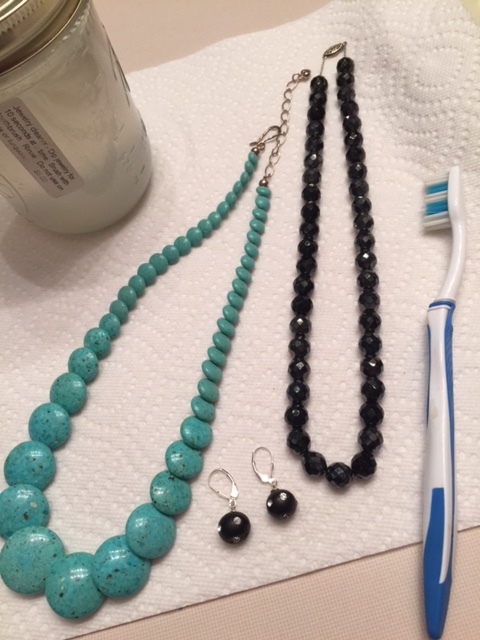 I used the cleaner on the ends only of the turquoise necklace. Notice the sparkle of the vintage black glass necklace in the last picture. 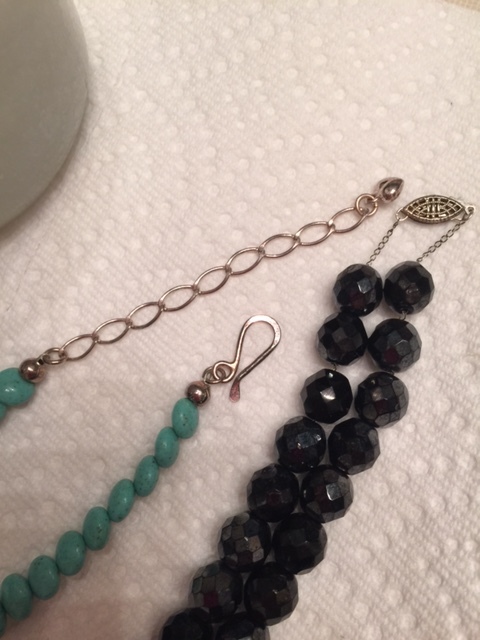 I hope this recipe helps you to get your sparkle back on the jewelry pieces you love.